Neighborhood Health is a non-profit community health center, dedicated to providing access to primary care for anyone living in Alexandria, Arlington or Fairfax County. Our main health center is a full-service facility, conveniently-located in the heart of the Richmond Highway corridor. We are located at 6677 Richmond Highway, directly across from Beacon Mall. We are open Monday through Friday from 8:00 am to 4:30 pm, with extended evening hours on Tuesdays. We are also open one Saturday morning per month for pediatric care. We have ample parking for our patients and are also easily accessible to transit via the Richmond Highway Express and the Fairfax Connector (Routes 151, 152, 159, 161, 162 & 171). Neighborhood Health has been providing primary health care in Northern Virginia for 20 years. We provide patients with a medical home -- a place where they can obtain all of their primary health care services. We offer primary medical care, dental care and behavioral health care for adults and children, so the entire family can access care in the same convenient facility. We have pediatricians, internal medicine and family physicians, dentists and behavioral health therapists -- all are licensed and board-certified. We accept most insurance plans, including commercial insurance, Tricare, Medicare, and Medicaid (Anthem HealthKeepers Plus and InTotal). If you have employees or their family members who do not have health insurance for any reason, we are able to provide very low-cost services if they financially qualify. All they need to do is call our office for an appointment at 703-535-5568, tell the representative that they do not have health insurance, and they will be given an appointment with Neighborhood Health’s Eligibility Specialist. Proof of income (pay stubs or a letter from their employer) is all they will need to determine if they qualify for our steeply-discounted fees. Depending on income, uninsured patients can see a doctor for as little as $15. Our dental fees for uninsured patients start at $25 for children and $50 for adults. Behavioral health services are subject to an initial telephone assessment for all new patients; our behavioral health director will discuss each situation on a case-by-case basis to determine whether it is within our scope of service. We provide access to free or low-cost medications through various pharmacy programs, which can help our patients save hundreds or even thousands of dollars per year. This is especially important for patients who are on multiple medications. The savings can mean patients can afford all of the medications they need and not have to choose between them. We also provide on-site labs. In addition to our full-service health center on Richmond Highway, we offer services at 10 other locations in the City of Alexandria, in Arlington, and in Merrifield and Annandale. 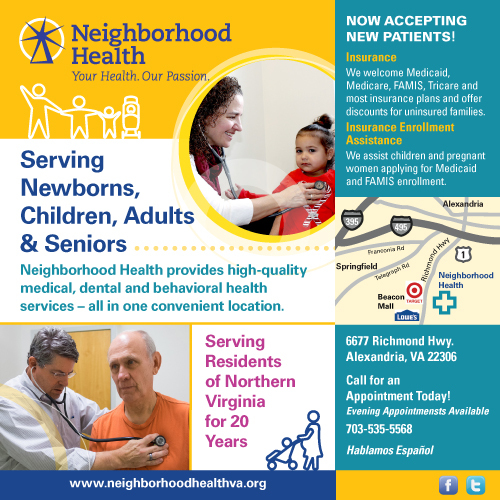 Please see our website www.neighborhoodhealthva.org for information on all locations and services.